Last week, I met this wonderful man named Klaus Wille. His energy was off the charts in a positive, radiant way. All smiles and glamorous charisma. 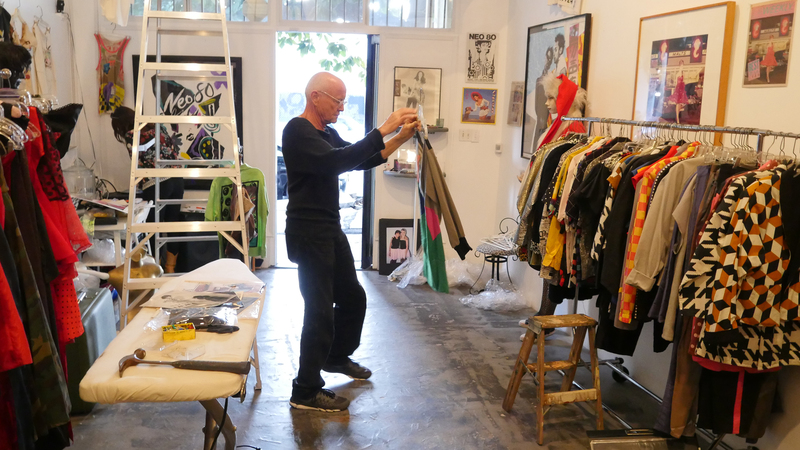 I found out that he was a costume designer and owner of a legendary shop on Melrose called NEO80, which existed in the 80’s and made one-of-a-kind, pioneering pieces for some of music’s biggest icons such as Madonna, Devo, The Tubes, Prince, Belinda Carlise, Dolly Parton, Olivia Newton-John, and anybody else during that time period who wanted to look like a Rockstar. Turns out that Klaus still has a huge collection of his masterpieces and was in the middle of organizing a Pop-Up event at Radiant Space in Hollywood. Being a huge fan of everything 80’s, I had to find out more about his enigmatic man. I asked him if I could come by the gallery as he was setting up to get a preview of his show and ask him a few questions. He was more than enthusiastic to have me. As I entered Radiant Space, Klaus was unpacking old photos from the early 80’s, and Mia Orozco, the Gallery Director, was helping him prepare for the opening night. Klaus is the type of person that you don’t even need to know anything about to like him. His spirit is amazing and transcends the air to reach you immediately. I bought in my camera and began filming him and asking him about his beginnings on Melrose Avenue. Back then it wasn’t a mecca of fashion, and the designs that Klaus and his wife, Lisa Elliot, made were cutting edge, and, for many, a little too outrageous. According to Klaus, they often received threatening mail. Fashion that was that dangerous. How could I not love it? Having grown up in the 80’s, I do remember when these new styles emerged and how they weren’t easily accepted by everyone. In fact, my father kicked my brother out of the house and burned all of his records because he thought they were too subversive. Looking at it now, it just seems like so much fun. All of the material is so bright and colorful and energetic, a true reflection of Klaus and his essence. Klaus told me that they had sourced a lot of the material from Italy and France, and often raided the Fashion District DTLA to find unique fabrics to fashion their clothing with. Klaus has two enduring mottos about his life and work: “Radiant Love,” which he does in seemingly endless quantities, and “Be a Rockstar. Dress like one!”, which he helped an entire generation do. To experience his designs is to experience all the pizzazz and flamboyance that made that decade so appealing. He even did a commercial for Tang. And the dress for a ZZ Top video. Klaus is in his seventies, but as sharp as a tack. He remembers every detail of his life as if it were yesterday. When I asked how he still has so much energy for what he does, he replied, “What gives me energy is creativity. Creativity and love.” I could definitely feel both of those things in the gallery. “I’m a loose, free spirit” he continued. “Many people don’t like that in society, because we’re all boxed in…brainwashed by the media…but I’m a free spirit and have been doing yoga and meditation since I was, um, five or six.” That didn’t seem like an exaggeration. He comes across as a youthful 20-year-old ready to take on the world. Just wow! I need to start doing yoga.